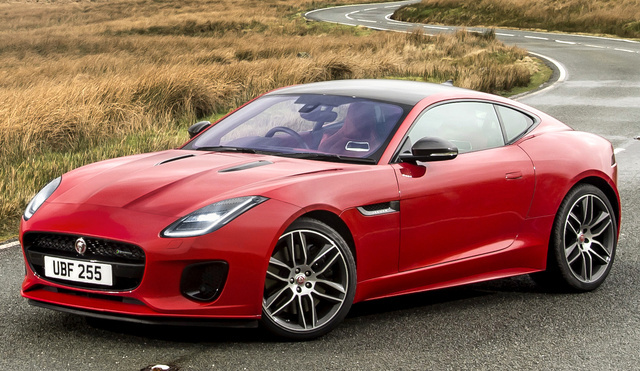 CarGurus has 174 nationwide Jaguar F-TYPE dealers with 1,504 new car listings. For 2019, the two-passenger Jaguar F-Type sports car receives only minimal updates as it enters its 6th year on the market. Available in coupe and convertible body styles, the F-Type is the natural heir to the automaker's iconic E-Type roadsters of the 1960s and ‘70s. Updated for the modern age, the F-type helped re-establish Jaguar's credentials as a builder of sports coupes as well as luxury-oriented sedans. Now deep into its first generation, the F-Type is scheduled for a full redesign, which could arrive as soon as 2020. The F-Type retains Jaguar’s old-school styling features like the long rounded front end, the low-roofed cabin, and the sloping fastback-style rear end. Up front, a sculpted hood, wide-mouthed black grille, and large lower air intakes project a bold, aggressive look. Narrow LED headlights with J-shaped daytime running lights follow the slope of the hood and sidelines, which rise to a distinctive haunch above the rear wheels. A lightweight rear liftgate comes with available power open/close. At the back end, a deployable spoiler, wrap-around LED taillights, and dual- or quad-chrome exhaust pipes add to the sporty feel. Coupe owners can opt for a panoramic glass roof or carbon fiber roof in place of the standard aluminum roof. The convertible comes with a retractable fabric roof, which lowers and raises in 12 seconds at speeds up to 30 mph. Other exterior features include LED headlights and taillights as well as 18- to 20-inch wheels, which vary according to the engine and trim level. The R and R-Dynamic get exterior gloss black trim while the SRV coupe features a carbon-fiber rear wing. The 2019 F-Type continues to offer Base, R-Dynamic, R, and SVR trim levels for both the coupe and convertible body types. Each trim is powered by a trio of turbocharged and supercharged engines with five levels of output. A 2.0-liter turbocharged Ingenium 4-cylinder engine provides base power for the F-Type. Available only on the Base trim, it generates 296 horsepower and 295 pound-feet of torque, driving the F-Type from 0-60 in 5.4 seconds. A mid-level 3.0-liter supercharged V6, which is also available on the Base model, delivers 340 hp and 332 lb-ft of torque, shaving 0.3 seconds off the 0-60 mph time. The R-Dynamic trim offers a tweaked version of the supercharged V6, boosting output by an additional 40 hp for 380 hp, 339 lb-ft of torque, and a 0-60 time of 4.8 seconds. The R trim gets a beefy 5.0-liter supercharged V8 pumps out 550 hp and 502 lb-ft of torque while the SVR trim gets an upgraded version of the same powertrain, which generates 575 hp and 516 lb-ft of torque. The 0-60 times for the F-Type powered by the two versions of the V8 drop to 3.9 and 3.5 seconds respectively. Depending on the configuration, the engines link to either a ZF 6-speed manual transmission or a ZF 8-speed automatic with a manual-shift mode and paddle shifters. Fuel economy numbers vary depending on the engine and transmission; numbers range between 15-23 mpg in the city and up to 30 mpg on the highway. To help buyers keep track of the various powertrains and performance figures, the automaker is launching a new badging system for 2019 based on each engine's hp output. F-Type trims powered by the base 296-hp turbo 4 will receive a P300 designation while those equipped with the 340-hp V6 will get a P340 badge. Trims with the 380-hp V6 will be identified by a P380 badge. The V8-equipped R and SVR trims will maintain their current badging. All F-Type trims deliver agile handling and a firm, aggressive ride thanks to a sport suspension, sport exhaust system, and performance braking system. Electric power-assisted steering, which comes standard on all trims, is tuned for precise control and responsive feedback. In its standard configuration, the F-Type rides on a rear-wheel-drive (RWD) platform, but buyers can add available all-wheel drive (AWD) on trims equipped with the 380-hp V6. AWD is included as a standard feature on the R and SVR V8 trims. All trims come standard with a rear differential and torque vectoring. Trims powered by the 380-hp V6 and the V8 add an Adaptive Dynamics system, which monitors the vehicle's driving dynamics and makes adjustments to improve acceleration, braking, and cornering. For 2019, Jaguar equips the F-Type with a new standard 10-inch touchscreen for all trims. The multi-touch screen supports swipe and pinch gestures, enables users to create a customizable home screen, and provides access to the vehicle's InControl Touch Pro3 multimedia system. The F-Type also features advanced safety systems like adaptive cruise control, emergency braking, lane-keep assist, and traffic sign recognition, and for 2019, Jaguar makes all of these features standard on all F-Type trims. Additionally, buyers can now choose from a total of 18 available exterior colors, including gloss and matte finishes. Inside the two-seat cabin, the driver-focused layout places all controls within easy reach thanks to a wrap-around design. Analog dials on the instrument cluster are clear and easy to read, and the 3-spoke sport steering wheel is equipped with buttons for key functions. Lightweight, leather-wrapped sport seats with suede facings provide good support and feature 12-way power adjustment. Aluminum trim on the center console adds a sporty touch. In addition to the new 10-inch touchscreen, standard tech features include navigation, satellite and HD radio, a rearview camera, push-button start, and a 380-watt 8-speaker Meridian audio system. The R trim adds Windsor leather upholstery, 12-way-adjustable R performance seats, and configurable ambient lighting, while the SVR includes SVR performance seats, a suede headliner, and a heated leather-wrapped steering wheel. In addition to newly standard lane-keep assist, adaptive cruise control, and traffic sign recognition, safety features for the F-Type include a rear parking aid with an available front parking aid, as well as dynamic stability control with a Trak DSC mode, which allows for a certain amount of vehicle rotation and wheel spin for more aggressive driving maneuvers. The coupe comes equipped with six airbags while the convertible gets four. In addition, the convertible includes a rollover protection system. An innovative Driver Condition Monitor on all trims detects drivers who might be drowsy or fatigued and sounds an alert. The NHTSA and IIHS have not safety tested the F-Type. What's your take on the 2019 Jaguar F-TYPE? Have you driven a 2019 Jaguar F-TYPE?